Episodes tagged: Puff Daddy - EwONE! Radio Mixshow - Official Podcast, What It Iz Right Now?! Episodes tagged with: "Puff Daddy"
(Fresh HH/R&B) - N.E.R.D./Wu-Tang/Meek Mill/A$AP Ferg/Puff Daddy/The Game/Chris Brown/Ty Dolla $ign/Snoop Dogg/The Cool Kids... & More! (Fresh Trap/Dancehall/R&B/HH) - Major Lazer & Grandtheft/Shaggy/Beyoncé/Kent Jones/Kodak Black/Ty Dolla $ign/Steve Aoki/Billy Blue/Young Chop/Kanye West/Fat Joe & Remy Ma/Puff Daddy & The Family... & More! (Fresh HH/Trap/R&B/Dancehall) - Kanye West/Major Lazer & Grandtheft/Steve Aoki/Zoey Dollaz/Remy Ma/Fat Joe/Puff Daddy & The Family/Snoop Dogg/Problem/AD/DJ Mustard/Tory Lanez/Poirier/Charly Black/Flavaone x Slick... & More! (Fresh HH) - Kanye West/Statik Selektah & KXNG Crooked/IamSu!/The Game/Puff Daddy & The Family/Freddie Gibbs/G-Eazy/Young Thug/YG/Curren$y... & More! 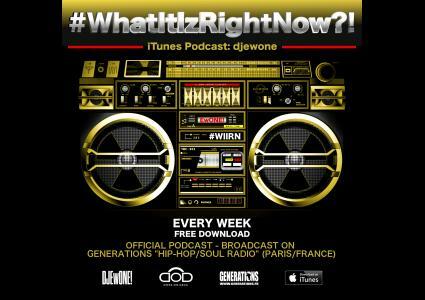 (Fresh HH/R&B) - John Williams/DoZay/DJ Mustard/AD/LiL Dicky/Mannie Fresh/Tinie Tempah/Puff Daddy/G-Eazy/Lotice/Anjali World... & More! (Fresh HH/R&B) - Akon/S.Y.P.H./GoldLink/Missy Elliott/Ty Dolla $ign/Puff Daddy/Pleasure P/I LOVE MAKONNEN/Fetty Wap/Redman... & More! (Fresh HH) - Busta Rhymes/Sheek Louch/Trina/Tyga/Timbaland/Prof/J. Stalin/Redman/DMX/Puff Daddy... & More! (Fresh HH/R&B) - The Game/Snoop Dogg/Redman/DMX/Puff Daddy/N.O.R.E./Tyga/Fetty Wap/Eric Bellinger/Lil Wayne/Rico Richie/G-Eazy/Big Grams/The Weeknd/WatchTheDuck... & More! (Fresh HH/R&B/Future Bass) - Snoop Dogg/The Game/Cap 1/Jade MAC ALLISTER/Trevor Jackson/Puff Daddy/Dr. Dre/Trae tha Truth/The Weeknd/G-Eazy/Missy Elliott... & More! (Fresh R&B/HH) - Lyrica Anderson/Puff Daddy/The Game/Blanco, YG & DB THA GENERAL/Ty Dolla $ign/Scotty ATL/Janet Jackson/Hurricane Chris/Joe Moses/S.Y.P.H... & More! (Fresh HH) - The Game/Zoey Dollaz/Timbaland/Prof/J. Stalin/Fetty Wap/Tyga/Puff Daddy/Big K.R.I.T... & More! (Fresh HH/R&B) - Dr. Dre/Tyga/Keith Ape/Meek Mill/Lil Dicky/Puff Daddy & The Family/Avery Wilson/Blaq Tuxedo/Kool John & P-LO/Trevor Jackson/Drake... & More!